Prep In Your Step: Meet Madeline from Madeline and Company! Preparing posts for this week has been an absolute blast since I've been ecstatic to share all of these various posts with y'all. 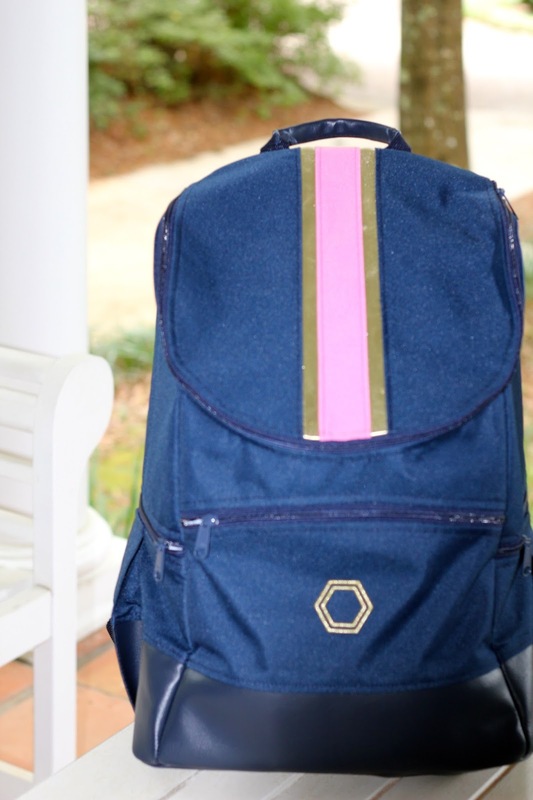 This one is no different as I am excited to share my new favorite backpack with you as well as introduce you to the ambition teen behind the brand! 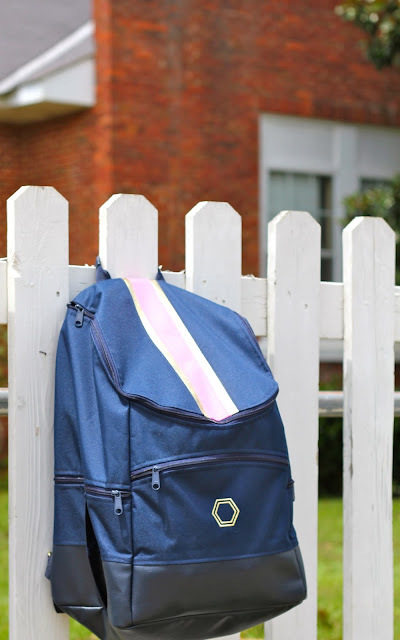 I came across Madeline and Company on instagram last month and was floored to see that although the brand was launching the following month they had already built a successful following which couldn't be too difficult considering how adorable their backpacks are. When Madeline (seen above modeling 2 of her backpacks) reached out to me a few weeks ago I jumped on the opportunity to share her company with y'all in order to encourage her success. 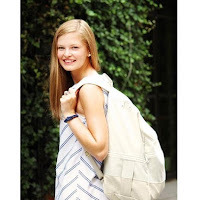 Madeline is a senior in high school who instead of spending her summer by the pool or hanging out on the couch created her own company and developed her perfectly preppy backpacks. I had so much fun communicating with her (she's seriously the sweetest) and hearing all of her ideas and passion for the brand she's developed. 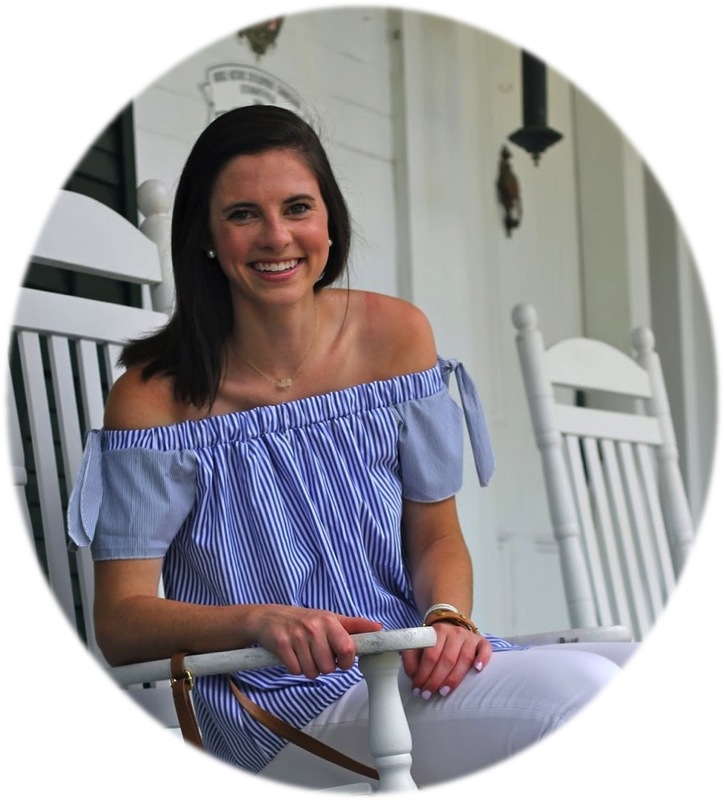 Madeline volunteered to answer some questions about Madeline and Company as well as the back to school season that I am thrilled to be sharing with y'all. I did my best to think of some creative ones so I hope you'll enjoy reading through her answers and seeing the backpack I chose in action. When did this design idea start coming to you and what was your biggest motivation for getting your brand started? I searched for a backpack for the past three years of high school, but I could never find one that incorporated everything I wanted. If I found a backpack that was functional, it would not be cute. If I found one that was somewhat stylish, it would be way too small. I definitely knew there must be other girls like me trying to find the same thing. My biggest motivation came from those around me. I have the best family, and I wouldn’t have actually followed through if it weren’t for their support. What design feature were you most eager to incorporate into your backpack design? I absolutely love the stripe lining on almost all of the bags! It is something I really haven’t seen before in school bags, so I was so excited to add this fun little feature! 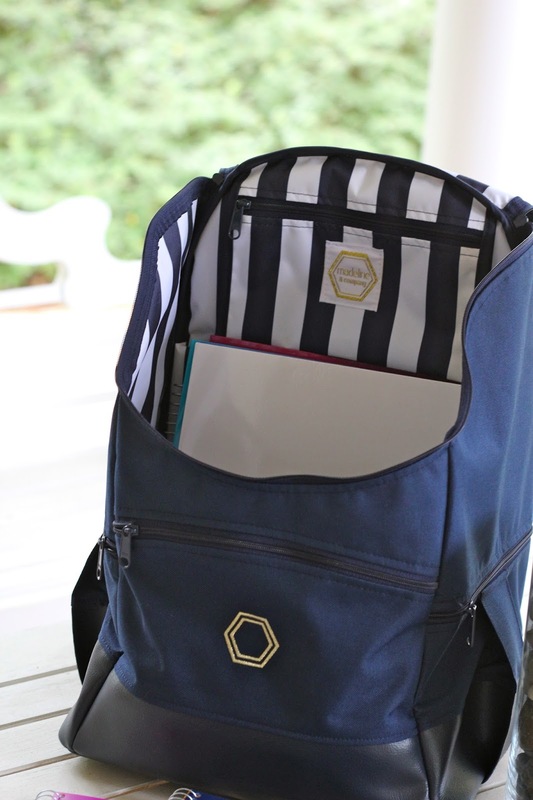 The bag is designed so that it stands upright when you have books inside (unlike most backpacks I’ve seen), so you can always see the stripes when it is open! Everything! I absolutely love classic colors plus a little metallic. Between my Mom’s design books and old J. Crew catalogs, I’ve found plenty of classic meets modern design. And who doesn’t love Pinterest inspiration? What has been the most exciting part of the process in creating Madeline and Company so far? I’ve had several pinch-me moments so far, but probably one of the most exciting things has been getting the first prototype bag in the mail from the factory! To see something we had only envisioned and talked about come to life was really fun! I love that you are able to participate in these business endeavors with your mom! Since I always feel like my mom is right and her advice is accurate what do you think has been her best advice/input thus far? She has taught me when you believe in something, there is always a way to make it work. When we were designing our “about us” page, we were initially told that it would be too difficult to create our own styled photo. My Mom wanted to make it happen, and eventually we worked it out. I was ready to give up after we were told no. I’m so glad I didn’t because it’s one of my favorite parts of the website! It really gives people a glimpse of who we are! Since you're not only a business owner but also a high school senior, what are you most looking forward to during your senior year? I go to a small high school, so I’m looking forward to all of the fun little traditions our school and community does for the seniors. I feel so fortunate to have grown up in such a tight knit community, so I know I will cherish our final year together. What is your go to school outfit? And which Madeline and Company backpack color scheme do you plan to use on the first day? I think I probably end up wearing something striped at least twice a week! My go to outfit would have to be a stripe shirt with white jeans and gold shoes. It’s something super easy to throw on, yet still looks pulled together. I haven’t officially picked out my backpack yet, but I’m leaning toward the navy with Carolina blue and gold. That could easily change, though––I like them all! 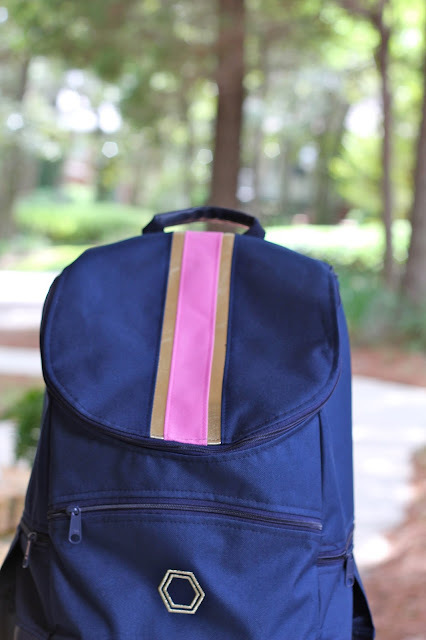 I love the navy with pink strips backpack. I think it is so pretty! I had already ordered a backpack before I saw your video with the backpack in it, thats when I wished I had waited!! Love your videos and your blog!! Both of you ladies are such an inspiration for young girls everywhere! Keep up the good work! Very classic looking backpack, and of course, I adore your backdrop for the photos!